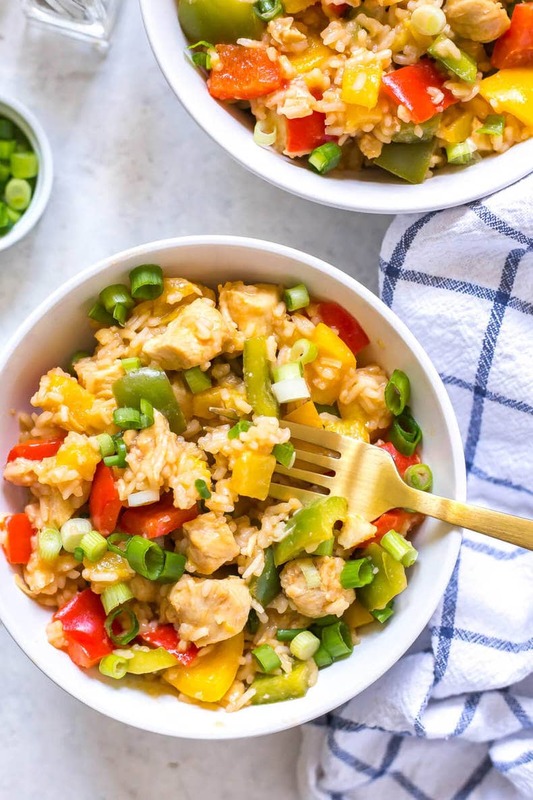 This Instant Pot Sweet and Sour Pineapple Chicken is a one pot meal prep idea that comes together with a 5-ingredient sauce that's made of mostly pantry staples – it's gluten-free, high protein and works with any veggie too! 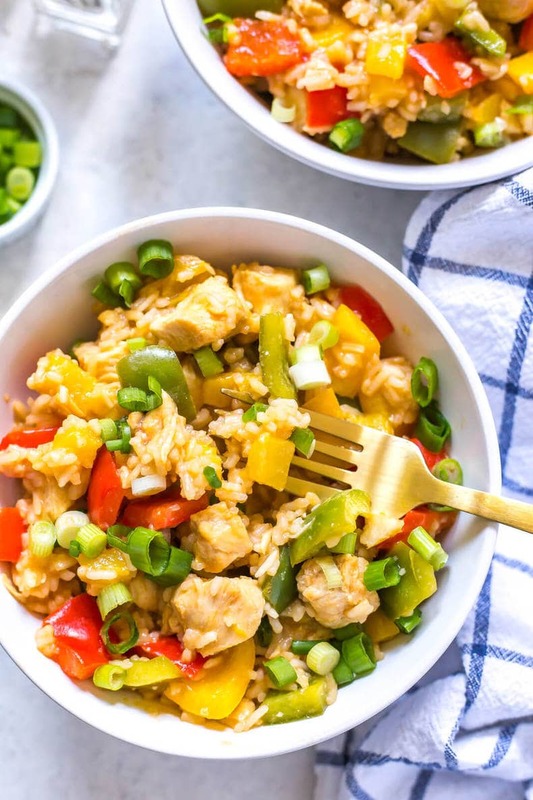 This Instant Pot Sweet and Sour Pineapple Chicken has GOT YOUR BACK! I love simple dump dinners like this, and with the exception of the fresh veggies this is basically a pantry dinner – you should have most of the ingredients on hand already and from there it's just about adding some fresh veggies. This recipe is honestly so easy you're going to forget that you're even cooking. Technically you aren't. You're just chopping up some chicken and veggies. Easy right?! 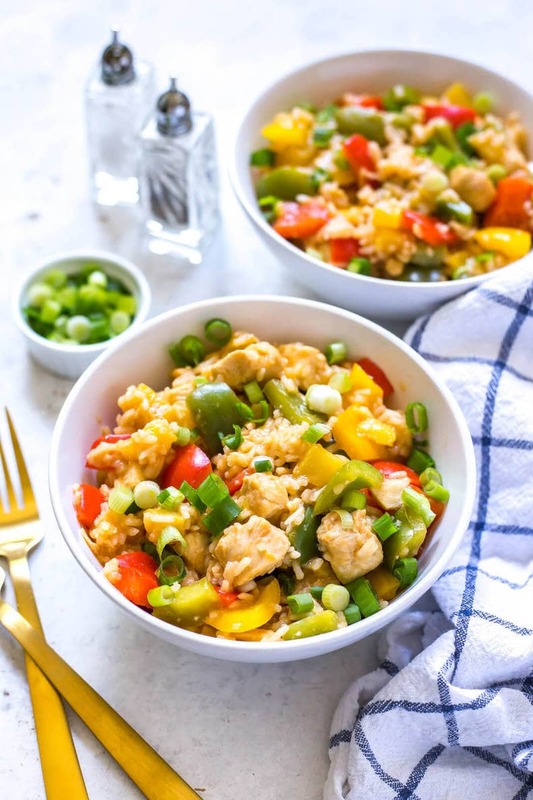 Now I have seen soooooo many recipes for sweet and sour chicken that rely on all kinds of pantry ingredients – everything from vinegar and ketchup to soy sauce and chicken broth to get that perfect combination of sweet, sour and savoury that we have all come to love with this takeout-inspired chicken dish. But you know what the secret ingredient really is, and the one thing you can't skip out on? Whether you have fresh pineapple on hand or are just digging into your pantry to pull out of a can of diced pineapple, you really do need to include it to get that signature flavour. And while I do also use rice vinegar and ketchup, the sweet and sour chicken flavour really can't be achieved without finely diced pineapple so don't try to make this if you don't have it on hand! 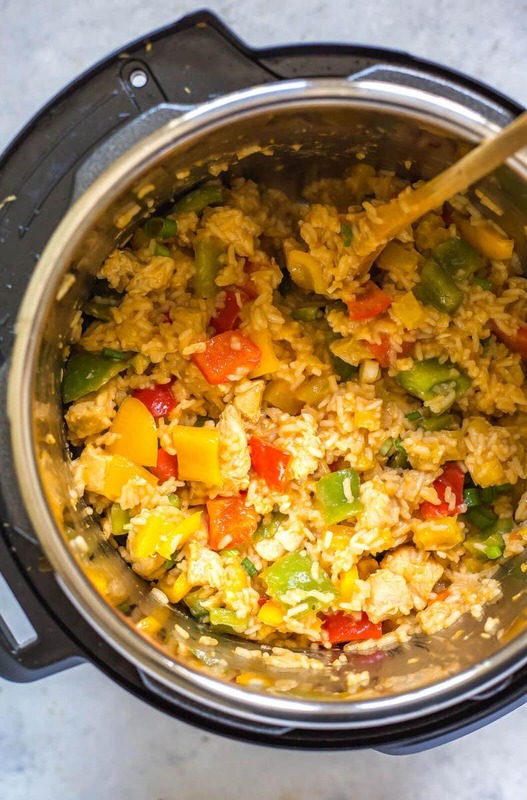 You have a bit more flexibility with the kinds of veggies you can use though, but I recommend stirring in veggies that are going to cook quickly at the end of the cook time in the hot rice and chicken mixture, like bell peppers. I ALWAYS have bell peppers on hand in the fridge that need to be used up so they're a no-brainer here, and I feel like they are easier to include too because then you don't have to cut up a variety of different veggies and worry about different cooking times, but you still get a full serving of vegetables. I should warn you that I like my bell peppers a bit on the crunchier side, especially if I'm eating them in a stir fry type of rice bowl so they don't get superrrrr cooked but they definitely get nice and tender sitting in the hot rice after you've cooked it on high pressure with the sauce ingredients and the chicken. I do really love the Instant Pot when it comes to making many of my takeout-inspired favourites because it's such a great way to make what I call “dump” dinners: you dump in all the ingredients, then set the time and forget it's even cooking. And the clean up is a breeze too! This pineapple chicken is so easy because you don't need to cook the rice separately, and you don't have to mix the sauce ingredients together ahead of time to pour over the chicken, you just pour everything in all at once. To avoid the rice sticking to the bottom, you're going to want to add it on top of all the other ingredients so it's kind of floating on top so to speak but that's really the only trick there is to it! 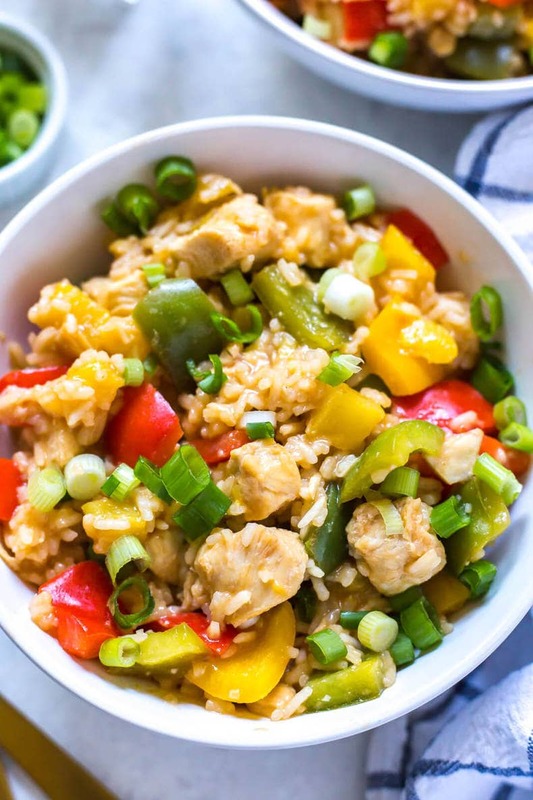 Once the sweet and sour chicken has done cooking, stir everything together, add your bell peppers, top with some green onions (and maybe even some cilantro if you love fresh herbs) and dinner has come together in a pinch super easily! You really don't have any excuse to grab takeout anymore, do you? Will you be making this Instant Pot Sweet and Sour Pineapple Chicken? 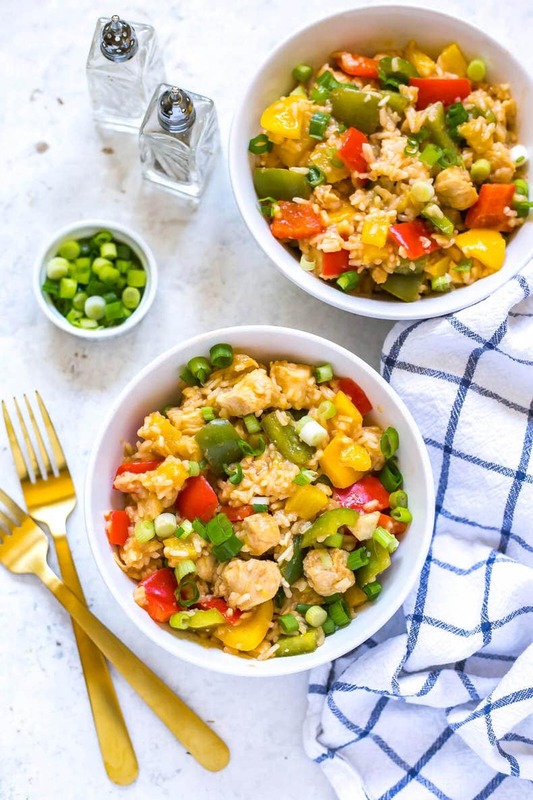 Whether you make it as your weekly lunch meal prep or enjoy it after a long day at work, you're just going to love the flavours in these takeout-inspired rice bowls! 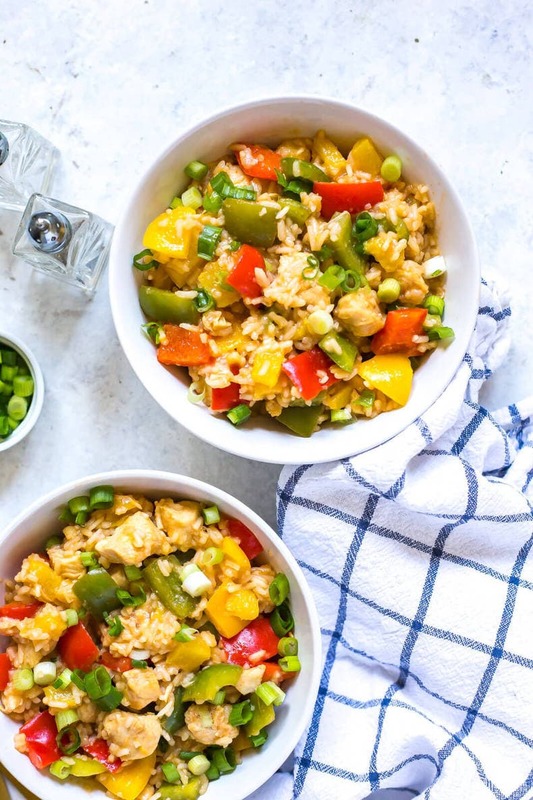 Grab some Glass meal prep bowls if you plan on packing this sweet and sour chicken up for lunch! 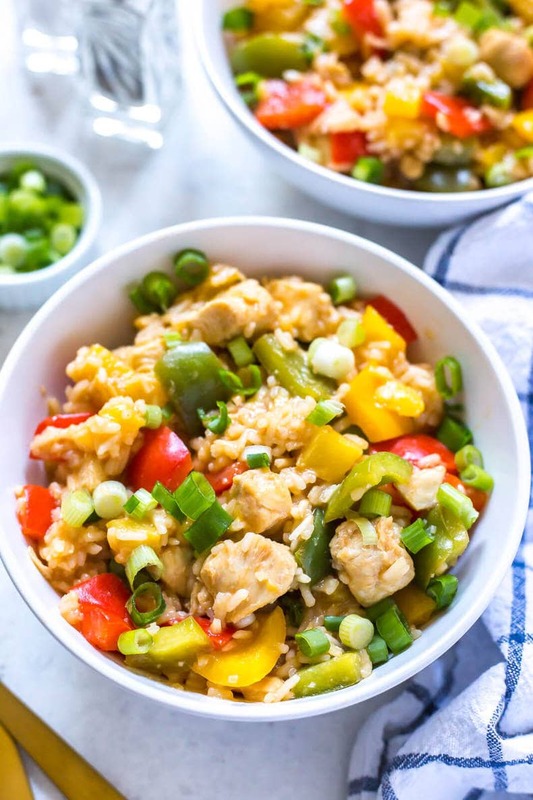 This Instant Pot Sweet and Sour Pineapple Chicken is a one pot meal prep idea that comes together with a 5-ingredient sauce that's made of mostly pantry staples - it's gluten-free, high protein and works with any veggie too! Add olive oil, chicken, pineapple, rice vinegar, brown sugar, ketchup, garlic, soy sauce, broth and rice to Instant Pot in that order leaving rice to float on top of other ingredients. Place lid on and cook for 2 minutes on high pressure. Instant Pot will take about 10 minutes to come to pressure then cooks on high pressure for two minutes. Do a quick pressure release and remove lid when safe to do so. 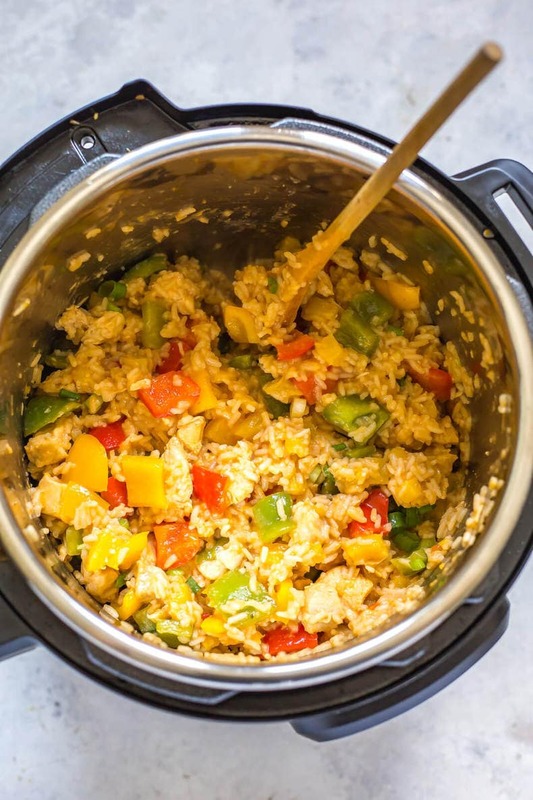 The rice may appear to be uncooked or crunchy looking at this point but it's crucial that you stir in bell peppers, then replace lid and let sit another 5-10 minutes so it can absorb the extra liquid. It does get fully cooked after sitting for a bit, I promise! Remove lid, then divide among four bowls. Top with green onions, then serve and enjoy! 2 minutes at pressure seems quick for raw chicken – is the chicken pre-cooked? Looking forward to trying this one. Hey Bruce! It’s not pre-cooked, it is raw. You’re not using much chicken (only two medium-sized breasts) and it’s diced up into small pieces so it cooks really quickly. Keep in mind the pot takes 10-15 minutes to preheat and come to pressure so the chicken is cooking all that time. I appreciate that comment of it cooking while pressuring, never really thought of that! Thanks! Pleasantly surprised, this was delish! I added in small chopped zuchinni with the bell peppers for a little veggie boost and I was sceptical if it would be done….be right back….went back for seconds! Fresh pineapple definitely the ticket. MAKE IT, you won’t be disappointed…just the right amount of sweet and sour. This was dinner tonight, with fresh pineapple. Very tasty and will certainly make again. Thanks for another great recipe! I followed the directions but the rice was not soft. Did you let it sit the full 10 minutes immersed in the hot liquid? Some people have different preferences when it comes to how al dente the rice is. I’m sorry you didn’t feel it was soft enough! Made this yesterday. Flavor was awesome, however chicken was tough (used tenders cut into small pieces) and rice was still crispy, even after leaving in pot for extra 15 minutes. Any suggestions? Hey Sylvia! Anytime you cut up chicken and cook it in the Instant Pot like this it gets a little tougher than usual. 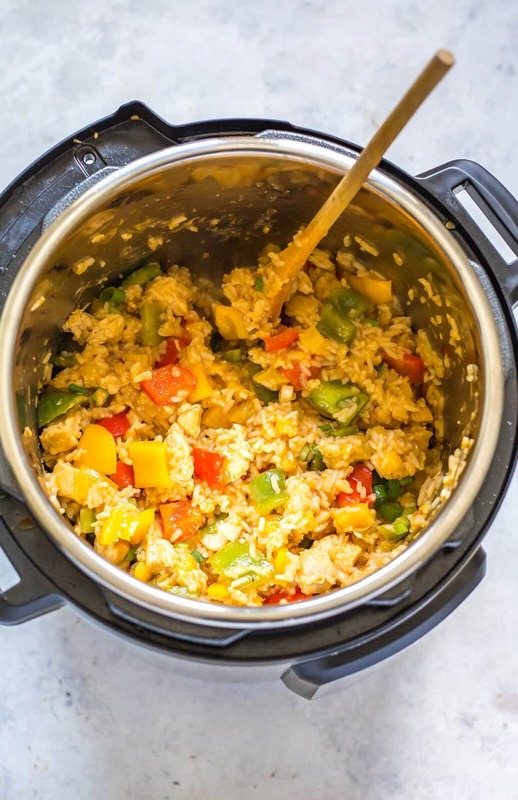 You’re swapping out active cooking for convenience I find…I’ve heard letting the pot pressure release naturally is a good alternative and saves some tenderness. In terms of the rice, I feel like it sometimes cooks different if you use a different kind (say white or brown rice over jasmine rice). If too much is above the wet ingredients sometimes it can get crunchy as well. Hope this helps if you make it again! Yes it does help. Thanks. I did use white rice, maybe that was the problem with the rice being crispy. Will try natural release. Came out perfect! I added Water chestnut at begging which was a great addition. Oooooh water chestnuts!!! That sounds amazing! Do you rinse the rice before adding to the pot? We added a few hot pepper flakes, other than that it was good except for the rice was not cooked enough, even tho we waited 15 minutes after adding peppers. Hey Daphne – sometimes it depends on the brand of rice used. Glad that you enjoyed! Could I use brown rice instead of jasmine rice? Hey Kelly – I haven’t tried brown rice myself but I’ve heard it can take 2-3 extra minutes on high pressure. If you try it let me know! I just made this for supper. 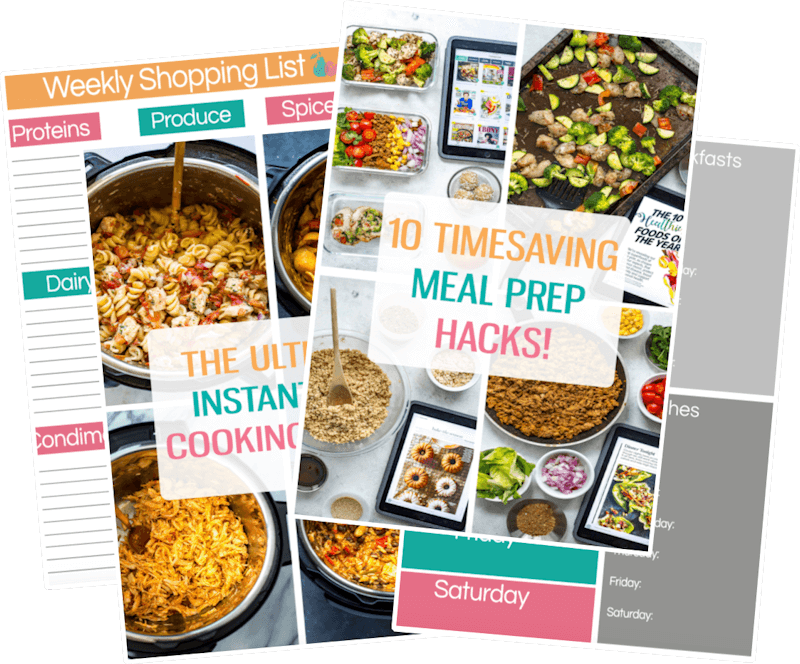 I’m having fun with my new Instant Pot!! This is sooooo scrumptious! And easy! Thank you! I used canned Pineapplt tidbits and home made turkey broth. The chicken is tender and moist. I did rinse the Jasmine rice and it was cooked to perfection. Next time I will use 2 Tbsp of brown sugar for health reasons. The Pineapple is plenty sweet already. I cooked early, so I did let it sit on warm about 30 minutes before we ate. Very very very yummy!! 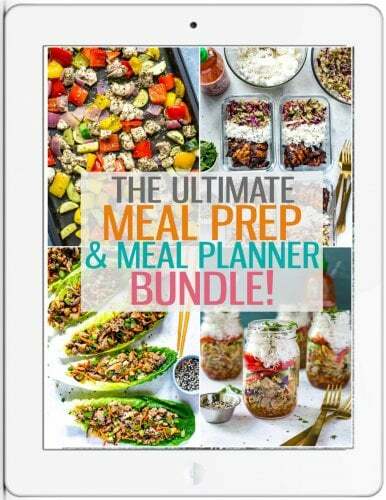 It’s going in my new favourites for Instant Pot Recipes! !